Since the death of my late husband i have been hospitalize right here in Philippines for some time due to my illness(Cancer of the throat/heart) also because of what my late husband’s relatives are doing to me. They wanted to claim every property that belongs to my late husband, because i am the only wife of my late husband and i did not have any child for my late and that i am supposed to know where my late husband kept his documents of the properties and as i am mailing from my hospital room/bed with tears on my face. i wish you can come down to Philippines to see what i am passing through right here in Philippines, if you don’t mind let me tell you how you can locate me. The name of the Hospital is Garcia Medical Centre (Address: 202 Mayapa Road , Barangay Mayapa Angeles City, Pampanga, Philippines. But understand that i cannot chat with you or call you because Msn And Yahoo Messenger is not installed in the laptop that i am using here in the hospital and we are not allowed to use telephone in "post operation ward" and "intensive care unit ward". Before the death of my husband on the month of September 2004 where he was hospitalized after the assassination in Angeles Univ. Foundation Medical Centre" "Address: Mac Arthur Highway, Angeles City, Pampangga, Philippines", he sincerely called me on his bed side and told me that he had a sum of $12.5 m US dollars (twelve Million US dollars) That he keep in a SECURITY COMPANY in Abidjan, before he finally die which he concealed the fund in a metallic trunk box as family valuables and deposited it with the security company instead of a bank because of security reasons base on the fact that he was the founder of the strongest rebel opposition group in PHILIPPINES then. He also used my name to Deposit the fund as his only wife for next of kin, he enlighten me that it was because of his position was why he was betray by his business associates and also advise me that I should seek for a foreign partner in any country of my choice where I will transfer this fund and use it for investment purposes, I want you to assist me to used this fund for an investment purpose, such as "Real Estate Management". So i want your re-affirmation that you are capable to help me transfer the consignment as what you will have to do after i have sent all the necessary documents to you, is just for you to contact the security company as my late husband's business partner and find out what it will take the security company to process and transfer the consignment to you through their diplomatic courier service. REAL ESTATE, HOTELS, PETROLUM INDUSTRY. (1)To serve as the guardian of this fund since I am woman of 35 years old. (2) To make arrangement for me to come over to your country for investment and to secure a residential permit as ur wife in your country. 1. If all my instructions as the initiator of the transaction would be taking for the betterment of and hitch-free of the consignment liftment to you, send your proof of identity(passport/drivers license) and your address so that i can have confident in you before we proceed. 2. Your capability and credibility in handling this transaction in every ramification is needed. 3. Your credibility and reliability as to avoid betrayal from you or seating on the entire fund when the trunk box is finally received by you. and arrange for a travelling documents to join you up in ur country. Thanks and God bless you for your anticipated cooperation . i enclose my photograpg and my international passort for ur view. I await to hear from you soonest. thanks once again for your endeavor to help me achieve my desire, may God continue to bless and multiply your endeavors. I want to assure you that i will provide you with all the details and documents that will be required by the security company to process the trunk box liftment to you in my next mail as far as you promise to be honest to me and if you are financially capable to process the consignment liftment. Besides my trust for you i will insist that we must exchange pictures and international passports before we will proceed so that if anybody goes contrary to agreement the person can be reported to his embassy or police agency with the international passport. If you do not have international passport you can send me your working identity card, drivers license or any personal identity. I wish to let you know that i do not have any need for material things now or need to lie for any worldly things or money because i am trying to reconcile with my God in case i finally did not survive, all that i seek now is salvation and God's intervention. Please i want you to always put me into prayer and beg God to forgive and accept my soul if this cancer decides to take my life though i believe that even if all my texts and medical reports proof that i may not survive i am sure that God makes a way only with impossible things because if it is very possible it can not be called Miracles, so Miracles come after hard times and impossible times. I want you to understand that it is the will of the lord that this consignment is still existing till date because after the death of my late husband his relatives took possession of all his bank notes, documents and his other investments just because i am a woman.beside,i did not have any child for my late husband. even his company in Cote d'ivoire was sold, but they never knew about the consignment and the content because it was not deposited in a bank which this was all that i inherited from my late husband apart from one small bungalow that i sold when my sickness was getting worst. I have made adequate enquiry about this transaction both in financial aspect because before i do anything with anybody i must be very plain and transparent with that person. From the explanations of the security company i was meant to understand that when you submit the application to the company, the security company will acknowledge receipt and commence verification to find out if you are the real owner of the consignment or if you are duly authorized to apply for the consignment release and liftment by the original "next of kin"(me) which will be done before they will give you the details of the consignment. Then after the security company have completed their verification they will also cross-check the deposit documents and details that we shall submit to them to see if it corresponds with the deposit details of the depositor (My late husband) in their digital file to finally confirm that we are his real next of kin and if it corresponds they will proceed to process the consignment liftment to you through the designated address that you shall submit to them. Note that if the details and deposit documents that we shall submit to the security company does not correspond with the details on their digital file our application will be disqualified by the security company and they will not accept to collect the airway bill shipment and processing fee from us because they will state that we are not the original next of kin to the deposit and for that reason the consignment will not be lifted to you which there will not collect any fee from you for any processes or liftment since it will not be released to you. But if the details and deposit documents that we shall submit to the security company corresponds with the details in their digital file the security company will agree to process the consignment liftment to you, so it is only on this note that the security company will require you to pay the" official "airway bill shipment and processing fee" which will be less than $800 united state dollars and this is definitely the only fee required all through the transaction and till you receive the trunk box in your country/address that you shall send to them. The other need for the airway bill shippment and processing fee as explained my the security company is that it will cover the expenses for the preperation of all the shipment documents needed for a hitch-free delivery, the flight delivery charge and all necessary certifications that will be done to ensure that the consignment will not be searched or scanned till it is received by you in your country. So the task ahead of me is to ensure that i will be able to get all the correct informations, certificates and data that will be required by the security company to approve the consignment liftment while the only task ahead of you which you must accept before we proceed is to help raise the fee for the airway bill shipment and processing if the security company approves the consignment release and liftment to you. So haven explained this to you in details i want you to acknowledge the understanding and acceptance completely before i will send all the necessary documents of the deposit and the security company contact details to you so that you can send your application for the consignment release to the security company immediately. For your re-affirmation i have attached my medical certificate, international passport and one of my pictures for your view so that you will have the confident to help me at any cost. I await your urgent mail after your final consideration so that i will send all the necessary documents and the security company's contact details to you if you are ready to comply with the terms explained in details to you regarding the transactional proceedings and financial cost to process the consignment liftment to you if we pass the "text of consignment ownership" and if the security company approves the consignment liftment to you. Subject: i wait ur re-affairmation and ur personal identity before we proceed. Compliments of the day to you, how are you doing over there? Thanks for your consistent understanding since i contacted you for this transaction. I am very happy for your level of corporation and understanding. However, I want to informed you once again that I will not be disposed to make any payment from here because I am still hospitalized which is one of the reasons why i contacted you for this project though I will reward you with 30% of the entire fund($12.5 Million) after receipt of the consignment for your financial assistance and endeavors while the balance 70% will be used for the proposed establishment. So before we proceed you must re-confirm your financial capability of been able to pay for the liftment fee($800:00), which must be paid before the consignment final departure to you in your country which is the only fee that will be required till you receive the consignment in your designated address/country you shall send to the security company thereafter couple with the application. Perhaps, according to the security company they said that it will not be possible to lift the consignment without advance payment of the required fee because it is the required fee that will be used to process some basic certificates in the court that will make you worthy as the consignment recipient (AFFIDAVIT OF TRUE BENEFICIARY) and another certificate that will declare that the consignment is not of any Anti-social activity which is the (AFFIDAVIT OF LEGALIZATION). According to them if these two certificates are not procured they can not lift the consignment successfully to you and it is the responsibility of clients to process these certificates. They further explained that the fee will also cover the Aircraft delivery charge and it is also the responsibility of clients to lift their consignments to their desired destinations which makes it understandable that we are suppose to pay the fee before they can process the consignment liftment out from there. I want to re-assure you before Allah that there is nothing to worry about. 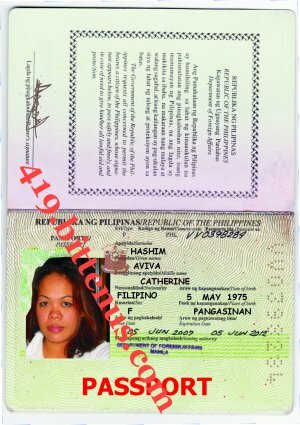 If the transaction is not legal and real i will not send my international passport, pictures and personal identities to you because if the transaction is not real i am aware that you will report me to my country embassy or police agency. Besides i have value for my life and personality more than money, all that i seek now is salvation. So respond urgently and let me know if you are ready to comply with the terms of the transaction and pay the only charges once the security company approves the liftment because why i am been skeptical about this issue because once you send your application to the security company nobody will have the veto power to apply on my behalf again and that will jeopardize the transaction if you abandon it after it is approved in your name/favour. I await your final decision in this regard so that I will send to you the deposit documents and also the security company’s contact address so that you can send your application to the security company without further delay. Thanks for your understanding and cordial corporation.